Where is Dow heading between Jun 4th - Jun 8th ? 400 point rally or 1000 point sell off. 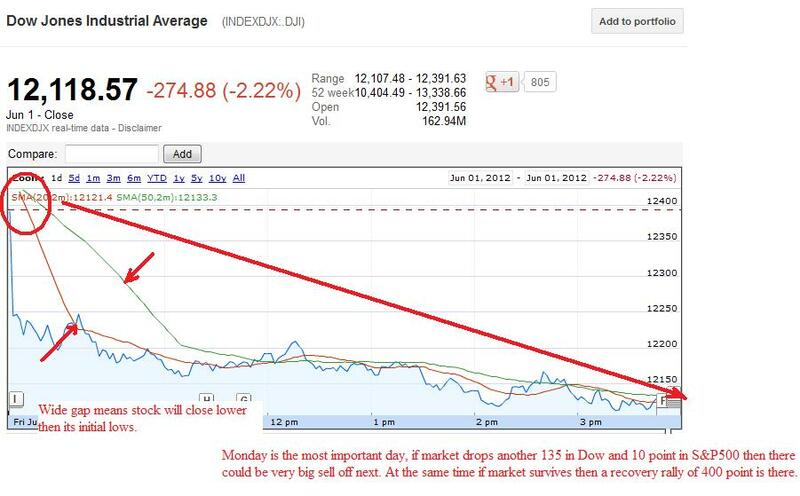 Dow Jones wiped out 1061 points it gained in 2012, and its down 99 point for the year. S&P500 wiped out 120 point or 12% it gained in 2012 and its up 20 points for the year. It took 5 month to get such big gains but it took 1 month to wipe out all the gains. 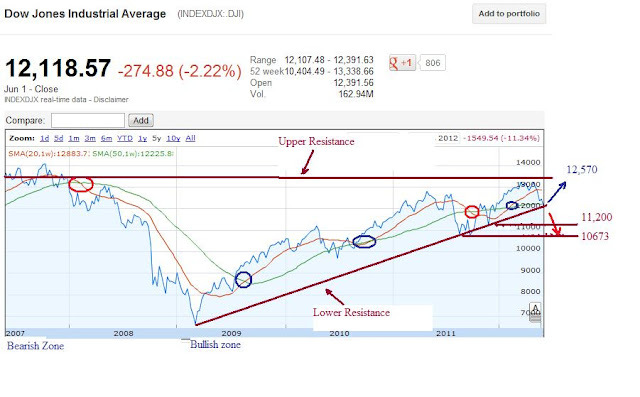 Bulls are hoping for a recovery rally after sell off while bears are hoping for 2008 crash. Lets analyses and see where Dow is heading next week. This chart pattern is also applicable to S&P500. If the market is able to survive Monday and Tuesday without closing in red, then temporary there could be relief rally. Chart of June 1st: The day started with disappointing China PMI which has been weak for 13 month and US non farm payroll for May showed only 69k jobs were added while expectation was 150k. For April non farm payroll was revised downward to 77k instead of previos projection of 115k. The net revisions for March and April were down 49k. Finally market realized it was a wrong data for which it rallied in past and it needs to readjust. Gold rallied 60 point on the hope of further easing. As I have said in my previous articles, 12225 in Dow and 1282 in S&P500 were key level and if it breaks then market enters into Crash zone which opens the door for another 1000 point drops in Dow and 100 point drop in S&P 500. Monday becomes the most important day for the stock market. A drop of 135 point in Dow and 10 point drop in S&P500 would trigger very big sell off within next few days. Since ECB will be printing money on Tuesday stock market is expected to rally or atleast open higher. Technical levels: For bullish sentiment to continue, Dow needs to break 12, 225 and S&P500 needs to break 1292. For bearish sentiment to continue, Dow needs to break 12065, and S&P500 needs to break 1269. Is 2008 like crash possible next week ? The answer is Not atleast next week. Neither a crash or rally is sustainable without consolidation. This market rose sharply between Dec - May 1st but there was no consolidation and so it dropped. Below is the 5 year chart for Dow, and near term it shows support at 12225 level and the market could rally to 12570 if it is able to close above this level. At the same time if Dow breaks 11,968, then 11,200 is also possible. Worst it could go as low as 10,673. Overall, I am still expecting Dow to be in 11965 - 12369 range. The chances of recovery rally is higher then sell off at least next week. I'ld still stick to previous alert, avoid this market till June 18th.